In many ways, MACRA is the best legislative incarnation of the triple aim that defines healthcare's value today. As the Meaningful Use program winds down, the Medicare Access and CHIP Reauthorization Act of 2015 aligns incentives so that good physicians win and patients get better, faster. Where the traditional fee-for-service world has left good physicians who provide high-quality care overworked and undercompensated, MACRA seeks to change that. Instead of receiving incentives for continuing to see patients and submitting more Medicare claims, physicians will benefit more from improving outcomes and keeping patients out of the office. 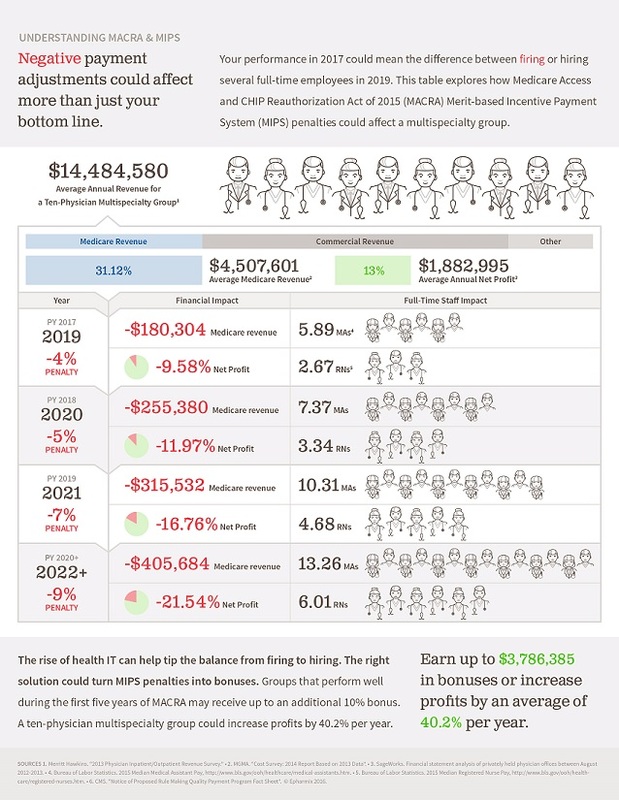 Conversely, if physicians do not focus their attention on MACRA, they may inadvertently put significant financial strain on their practices, as illustrated by the infographic below. With this shift, digital health companies will have an opportunity to play a significant role in helping practices meet new MACRA requirements. The goal of healthcare technology is to make it easier and more practical to pay for value and quality. MACRA's Quality Payment Program helps make that feasible through two systems: Advanced Alternative Payment Models (APMs) and the Merit-Based Incentive Payment System (MIPS). The upshot of MACRA is that physicians now must consider how technology helps them improve care, rather than simply relying on Meaningful Use technology implementation. The MACRA legislation states: "Ultimately, MIPS should, in concert with other provisions of the Act, support healthcare that is patient-centered, evidence-based, prevention-oriented, outcome-driven, efficient, and equitable." MACRA includes further requirements for electronic health record usage (following Meaningful Use Stage III), but the most challenging components lie within three new performance metrics that determine overall bonus or penalty. • Quality (50 percent of total year one score) — MACRA will affect Medicare Part B payments. All physicians who see Medicare patients must take quality into consideration, even if they haven't opted into accountable care organizations or other value-based systems. For physicians who have practiced the same way their entire careers, it can be unsettling to consider that payments their businesses rely on are now heavily tied to patients' outcomes. • Clinical practice improvement (15 percent of total year one score) — Physician practices now need to consistently launch new programs that are aligned with MACRA's guidelines. They must choose from 90 approved Clinical Practice Improvement Activities (CPIAs) outlined in the legislation (Table H) that include population management, care coordination, and beneficiary engagement. • Cost (10 percent of total year one score) — The MIPS cost score is calculated with Medicare claims. Thus, physicians must find innovative ways to keep patients out of the office and reduce excessive claims. With healthcare spending at 17.1 percent of the nation's gross domestic product and consolidation within the payer market, the burden on providers to reduce costs will continue to increase. 1. Provide evidence-based tools with clinically validated outcomes. To sustain their practices, physicians must be able to cite quality measures that are at or above that year's required benchmarks. With a sea of different health IT solutions competing for attention, companies with strong clinical evidence will garner physicians' trust that their technologies can make significant impacts on their current quality scores. 2. Design turnkey solutions that are aligned with multiple of the 90 CPIAs. Physicians' offices and teams are already busy enough — and now they need to launch quality initiatives. So instead of relying on their staffs to launch new protocols and workflows, providers will look to digital health companies for turnkey solutions that help them easily achieve their CPIA goals. 3. Improve remote monitoring of patients when they are out of the office to reduce unnecessary visits. Visits that don't result in substantial improvement in a patient's particular outcome will hurt the practice's net MIPS cost performance score. Quality remote monitoring technology allows providers to care for patients without scheduling unnecessary visits that tie up staff time. Additionally, digital health companies that want to help providers comply with MACRA should ensure that their products help physicians increase their reach to additional patients. If the technology fits into the current workflow and makes a substantial impact on patient outcomes, it will have a better chance at wide clinical staff adoption and utilization. Consequently, companies that succeed in driving value to physicians through MACRA will have a better chance at thriving in the new value-based healthcare industry. Joe McDonald is co-founder of Epharmix, a company at the intersection of medicine and consumer technology offering interventions that use automated phone calls or text messages to manage patients' conditions while collecting disease-specific data. With interventions designed by leading doctors and clinically proven at medical institutions, every patient can benefit from Epharmix.